The Intercontinental Ballistic Missile, LGM-30 that also known as "Minuteman III" is an American missile system. The Minuteman weapon system was conceived in the late 1950s and deployed in the early 1960s. Minuteman was a revolutionary concept and an extraordinary technical achievement for U.S. military. From the beginning, Minuteman missiles have provided a quick-reacting, inertially guided, highly survivable component to America's nuclear Triad of nuclear deterence against the Soviet Union. Minuteman's maintenance concept capitalizes on high reliability, movable and replace" approach to achieve a near 100 percent alert rate. By the time the Minuteman IIs of the 564th SMS were placed on strategic alert in the spring of 1967 during the height of Cold War, significantly toady some remnants still in a progress to be developed into an even more advanced ICBM system. The Minuteman III, a new version of modernized Minuteman I and Minuteman II. 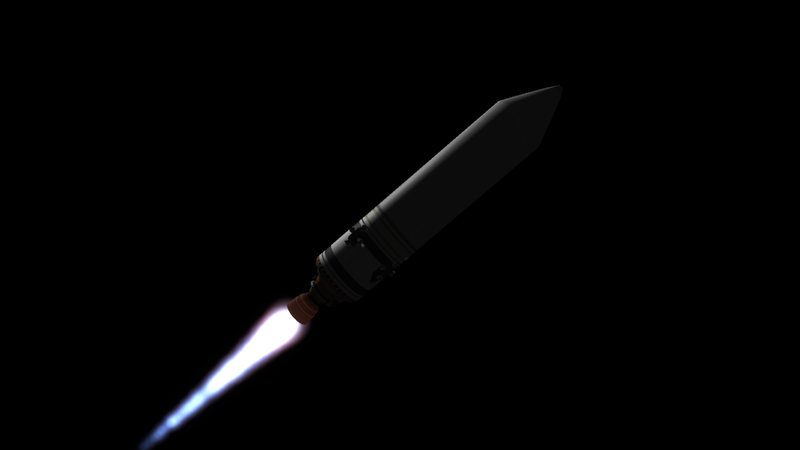 It can provides multi-reentry vehicle with warheads that can penetrate and deploy through flexibility maneuvers. On 17 April 1970, an important Minuteman III milestone was reached when the first missile was placed in a silo assigned to the 741st Strategic Missile Squadron, Minot AFB, North Dakota. At the end of December, the 741st SMS became the first SAC Minuteman III squadron to achieve operational status. Strategic Air Command expected Minuteman to play an important role in the command's force structure beyond the 2000 century. To ensure the reliability and maintainability of the Minuteman force into the next century, the Air Force initiated a major Minuteman upgrade system and modification program. Rivet MILE (Minuteman Integrated Life Extension Program) began 1 April 1985 at the 341st Strategic Missile Wing, Malmstrom AFB, Montana. This joint Strategic Air Command and Air Force Logistics Command effort was the largest single missile logistics program ever undertaken within the ICBM program. Through state-of-the-art improvements, the Minuteman system has evolved to meet new challenges of modern generations and assume new missions capabilities. Modernization programs have resulted in new versions of the missile, expanded targeting options, significantly improved accuracy and survivability. Today's Minuteman weapon system is the product of almost 35 years of continuous enhancement. Peacekeeper missile deployment also affected the Minuteman force. As part of the strategic modernization program undertaken in 1982, Strategic Air Command deployed fifty Peacekeeper missiles in modified Minuteman III silos assigned to the 400th Strategic Missile Squadron, 90th Strategic Missile Wing, F.E. Warren AFB, Wyoming. Conversion began on 3 January 1986, when the first Minuteman came off alert, and the phaseout of the 400th SMS's Minuteman IIIs was completed on 11 April 1988. The current Minuteman force consists of 530 Minuteman III's located at F.E. Warren Air Force Base, Wyo. ; Malmstrom AFB, Mont. ; Minot AFB, N.D.; and Grand Forks AFB, N.D. As a result of U.S. initiatives to cancel development programs for new intercontinental ballistic missiles and retire the Peacekeeper ICBM, Minuteman will become the only land-based ICBM in the Triad. To compensate for termination of the Small ICBM and Peacekeeper Rail Garrison programs, DOD will conduct an extensive life extension program to keep Minuteman viable beyond the turn of the century. These major programs include replacement of the aging guidance system, remanufacture of the solid-propellant rocket motors, replacement of standby power systems, repair of launch facilities, and installation of updated, survivable communications equipment and new command and control consoles to enhance immediate communications. 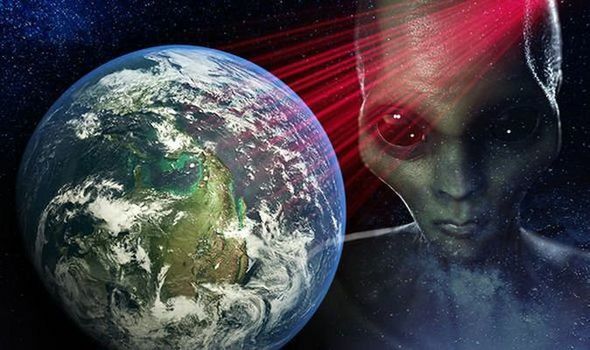 In order to meet warhead levels set by START II, the United States has decided to permanently DEMIRV Minuteman III missiles from their current capability to carry up to three reentry vehicles to a newly configured single reentry vehicle system once the treaty enters into force. "Downloading" Minuteman III missiles from three reentry vehicles to one lowers the military value of each missile; reduces the likelihood of any country expending resources to preemptively attack America's ICBM force; and decreases the probability of future US leaders being force into a "use or lose" position. For a downsized force of 500 single reentry vehicle Minuteman III to continue to be an effective deterrent force, the guidance replacement program will improve the needed accuracy and supportability that is inherent in a smaller missile force. Peacekeeper missiles will be deactivated by 2003, provided START II is ratified and enters into force. Ultimately, a total of 500 single RV Minuteman IIIs will be the nation's ICBM deterrent force through 2020 The LGM-30 Minuteman missiles are dispersed in hardened silos to protect against attack and connected to an underground launch control center through a system of hardened cables. Launch crews, consisting of two officers, perform around-the-clock alert in the launch control center. 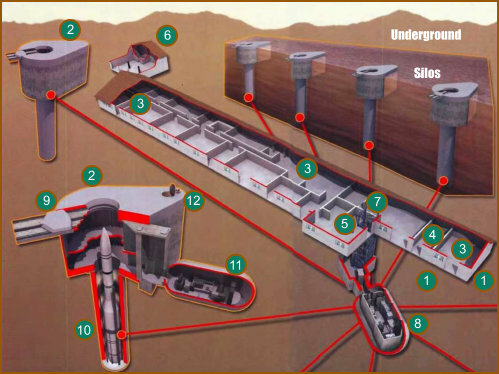 The Minuteman Silo comprises about 95 manned Launch Control Facilities (LCF) as indicated Fig (1) on the figure and some 950 unmanned Launch Facilities Fig 2 located about 3.5 -17.5 miles away from the main LCfs. The LCF and LFs shown above are illustrating the physical structure at Ellsworth AFB Launch control center, in South Dakota. This U.B.M include the above-ground accommodation facilities with bedrooms for the personnel and Duty rooms Fig (3) and generator Fig (4),Security Control Center in Fig (5). There is also vehicle parking lot to the rear of the main building Fig (6), which is lay next to Accessing elevator Fig (7) descending to the Launch Control Center (LCC) at Fig (8). 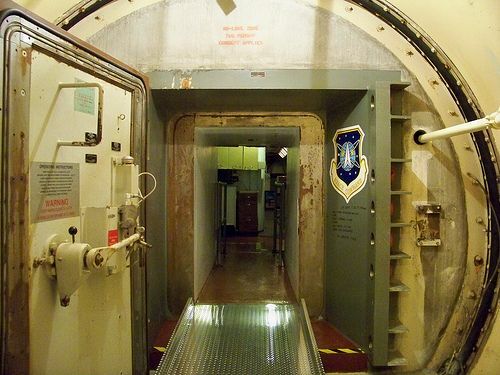 Within the concrete shell of LCC there is another section a missile capsule command suspends from the walls, to protect the facilities from nuclear shock and explosion when the ICBM is being fired. The command capsule has its own air and water supply, plus an escape hatch. The LFs at Fig (2) have heights about 85ft from the top to the bottom of the structure, with an aperture of 12ft wide at the top which can be sealed with a launcher closure as it shown at Fig (9) . Each LF has a luacher tube in Fig (10) and a launcher equipment room Fig (11) that containing operational and maintenance machinery. At the top of each LF there is an access hatch for the personnel to enter inside the silo. A variety of communication systems provide the National Command Authorities with highly reliable, virtually instantaneous direct contact with each launch crew. Should command capability be lost between the launch control center and remote missile launch facilities, specially-configured EC-135 airborne launch control center aircraft automatically assume command and control of the isolated missile or missiles. Fully qualified airborne missile combat crews aboard airborne launch control center aircraft would execute the NCA orders. Both the missile and basing components incorporated significant advances beyond the relatively slow-reacting, liquid-fueled, remotely-controlled intercontinental ballistic missiles of the previous generation. 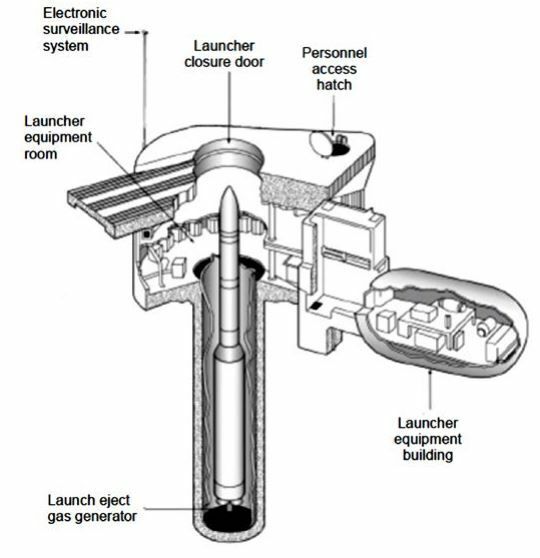 Its liquid injection attitude control system with a fixed nozzle on an improved third stage motor increased the Minuteman's range and the Minuteman III reentry system could deploy penetration aids and up to three Mark 12 or Mark 12A multiple independently-targetable reentry vehicles. A liquid-fueled post-boost propulsion system maneuvered the missile prior to deployment of the reentry vehicles, while upgraded guidance system electronics enhanced computer memory and accuracy.